Relentless Hosting Review 2019: Is Relentless Hosting a Good Hosting? 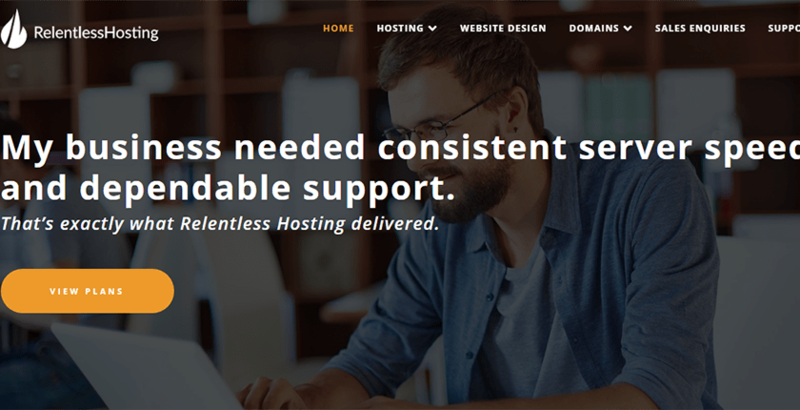 Australia-based Relentless Hosting is a host that's managed to find a near-perfect balance in creating a product that's easy to use but robust enough to host any site you can create. While their support is a bit lacking over other services, their advanced features set them above similar providers. Relentless Hosting is an Australia-based hosting company that was started in 2010 as a hobby among two friends. They slowly grew their business, and in time, the site has earned the trust of thousands of customers around the world. Relentless Hosting has earned customer trust by offering a product that is simple enough for beginners but robust enough for the most experienced users to host their site at a reasonable price. The Installatron application builder is great for beginners as you can install over 100 applications, including WordPress, Joomla, Drupal, Magneto, and many more. Of course, you can opt to use their drag and drop builder or create your site from scratch. Litespeed web servers are up to nine times faster than servers using Apache. I was quite happy to see Python supported by this host as most either don’t support it or only support it in their most expensive plans. Any service offering free SSL certificates deserves another look as that will save you money over many hosts that charge $30 or more for each certificate. Relentless Hosting offers the right balance of both ease of use and functionality. With their drag and drop builder and Installatron app, beginners can quickly set up their site. Offering the latest cPanel and unlimited FTP access makes it easy for most any webmaster to set up their files. With enhanced support for Perl, Python and more, power users have the freedom to design their site as they see fit. Relentless hosting offers two forms of shared hosting, Personal, and Business. They don’t provide any free access, but all paid plans come with a 30-day money back guarantee. Below is a breakdown of the differences in the personal plans. Addon domains are the domains you can host in addition to your primary domain. The Budget and Starter plans are a bit light on storage. Enhanced and Premium are a much better option for a single website or a group of low volume sites. Relentless Hosting also offers four Business hosting plans that give you greater storage, increased bandwidth, and unlimited domains. I like the business plans because the storage is much greater provided you’re not trying to run a large network of sites. Another advantage of the business plans is you get a dedicated IP address for your website. One area that needs improvement with Relentless Hosting is their customer support. The only options they presently offer is a knowledge base and online ticket support. The knowledge base is somewhat simple but can answer many basic questions. Anything more requires a ticket. The site doesn’t list an ETA on tickets, but I sent an inquiry and received a response in about three hours. Unfortunately, the same question could have been resolved in five minutes with live chat or phone support. Relentless Hosting offers fantastic hosting options that are perfect for personal and business websites alike. Their products are simple to use and great for those looking to host their first site. It is also ideal for advanced users looking for robust shared hosting that offers the features they need to build the website of their dreams. Wondering how Relentless Hosting stacks up against other Web Hosting companies? Enter any other Web Hosting company and we will give you a side-by-side comparison.